Shuck and Jive: "Evolution is the biggest lie ever perpetuated on mankind by Satan"
"Evolution is the biggest lie ever perpetuated on mankind by Satan"
The following letter to the editor is a response to the response to the response to my recent Evolution Sunday sermon and article. A creationist has words for my apostate church! Woot! I would like to respond to Amy Williams' editorial printed in the March 9, 2010 edition of the Star regarding Evolution Sunday at First Presbyterian Church. First I would like to state that it is not my intention to attack Ms. Williams nor the church she attends. But the Bible warns that in the last days that there will be apostate churches. An apostate church is one that has fallen away from the teachings of our God of the Bible. I have studied creation science for nearly 20 years, so I feel qualified to speak on the subject. First, evolution is only a theory, not a fact as Ms. Williams claims. Secondly, much of science is interpretation. Case in point, ever watch an episode of CSI? A half a dozen investigators (using proven science) can investigate a crime scene and come up with a half a dozen theories as to what happened, but only one is correct. 1. Transitional forms -- formerly called "missing links," but scientists didn't want to admit there was anything missing in their theory of evolution so they changed the name to transitional forms. Not a single fossil of any transitional form has ever been found. The Bible clearly states each animal was created after its own kind (species) and that's still what we have today. There are no half & half (nor any other ratio) creatures in existence today nor evidence that they lived in the past. 2. Nebraska Man -- from a single tooth found in Nebraska a whole new species of prehistoric man was created by scientists. Nebraska Man made it into school textbooks. The tooth turned out to be not from a human, but that of a pig! 3. Piltdown Man -- a hoax. Another prehistoric species of man created by scientists. Turned out to be a human skull matched to a jaw bone of an ape. Again, it made it into school textbooks. 4. Brontosaurus -- the most famous of all dinosaurs never existed, even though a skeleton of one sat in the New York Museum of Natural History for over 50 years. Turned out that the brontosaurus is actually an apatosaurus with the head of a camarasaurus. 5. Paluxy Riverbed Fossil -- a fossil found near Glen Rose, Texas has dinosaur and human footprints together side-by-side fossilized in the same layer of mud. But how can that be? Evolution says dinosaurs lived millions and millions of years before man....did they? Not according to this scientific proof. 6. Global warming -- now called "climate change" due to recent cold winters. It was only about 20 years ago that scientists were warning of a new ice age coming on the horizon. Now our Chicken Little scientists claim we'll all be swimming in a few years because the ice caps are melting. Well, which is it? Didn't I just recently hear climate scientists were falsifying records to "prove" climate change. Why would they do that? Well, think about it. No climate change -- no climate change funding -- hence no job. Just because a person puts on a white lab coat, doesn't mean he's telling you the truth. Scientists are human. Humans lie, cheat, steal and make mistakes. The same science that "proves" evolution is the same science that also proves the Bible -- not that it needs proving. By the way, nothing in the Bible has ever been disproved by science. Evolution is the biggest lie ever perpetuated on mankind by Satan. Our society today is brainwashed in evolution by the schools and by the media. There is good creation science out there; it's just hard to find as evolutionists try to suppress it through coercion and academic blackmail. Science is science -- as I said in the beginning, it's all in how you interpret it. In closing, I personally prefer to put my faith in creation (God) rather than evolution (man). Quite frankly, I think it takes more faith to believe in evolution than it does creation once you really know the facts. Ms. Williams, I encourage you to do your own research if you really want to know the truth. May I suggest the book: "The Lie... Evolution" by Ken Ham. A good resource for creation materials is: Institute for Creation Research, P.O. Box 2667, El Cajon, CA 92021-0667 or you can find them on the web at http://www.icr.org/. Now before we run off screaming into the darkness, we have to take a breath. One cannot understand the true believer. One can only marvel. Having people write this kind of stuff in the newspaper is in the long run, a good thing. Controversy moves understanding ahead. 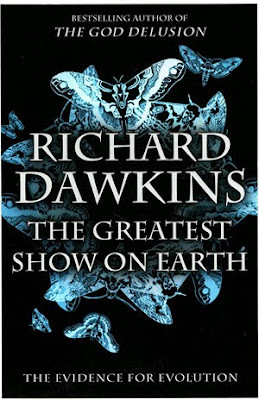 Helpful in this quest is the latest book by Richard Dawkins, The Greatest Show On Earth. This book will fall on Mr. Bradley's deaf ears as Dawkins is certainly one of Satan's minions. "I have studied creation science for nearly 20 years,"
How sad that this person wasted 20 years of their life and never actually understood anything. Though I do love how the best they can do is compare real science with CSI. "Studied" - for 20 years - I don't think so. He should be ashamed for letting his ignorance show. He should read Bishop John Shelby Spron's book "Eternal Life - A New Vision." But then it probably wouldn't make any difference. It is hard (impossible) to argue with "true believers." My friend says there are 6 billion people in the world. When you find one like him you just say "good-bye." and move on. Waste of breath to argue with him. He won't be turning himself in to Glenn Beck any time soon, I'll warrant. Wow, some of those arguments were floating around in creationist circles back when I was a teenager 35 years ago (Piltdown man, for example). It's the same talking points that they circulate and repeat over and over again, because it is easier repeat something you saw in a pamphlet than actually having knowledge of the subject. It is frightening regarding the influence of churches on people's lives. It is Jesus or Satan. And Satan is the evolutionist. It truly is nearly impossible for those who have grown up in fundamentalism--and that is the dominant religion here--to move beyond it. I found myself at a weekend Girl Scout event. While speaking with another GS (!) leader, she explained how she tells her daughter to answer science questions about evolution as she is "expected" to in a public school. However, privately, at home, and presumably I was to agree, she knows that we do not believe we came from "monkeys." It was so appalled and uncertain how to explain that I surely do believe in evolution. I wish willful ignorance would not be so stubborn. I saw all the anti-evolutionist propaganda when I was growing up in a conservative Protestant church. I also had an interest in science, and ultimately evolution was a major factor in a crisis of faith that I underwent at age 16 when I finally told my parents I had become an atheist. I became filled with resentment towards religion in general and it took me a long time to get over it-actually, come to think of it, I never did get over it. "evolution was a major factor in a crisis of faith that I underwent at age 16 when I finally told my parents I had become an atheist. I became filled with resentment towards religion in general and it took me a long time to get over it". This is the biggest problem with the "anti-science" religious lot. The think people will decide between science and church. They actually drive thinking people away who then have to decide how much time and energy they want to put into finding their way back. If the churches just allowed people to have their faith and their science too, they'd keep their pews filled. Everyone saves a lot of time and trouble. This is in today's Johnson City Press, Christian home-school texts leave out Darwin. This is why awareness events such as Evolution Sunday and the Clergy Letter Project are important. People think (because they have been told by religious authorities) that they must choose between science and faith, between God and Darwin. You don't have to choose. But you do have to think. "creation science". Ahhh, now that's a lovely oxymoron. But what can you expect from people who can't tell the difference between a theory and a hypothesis?